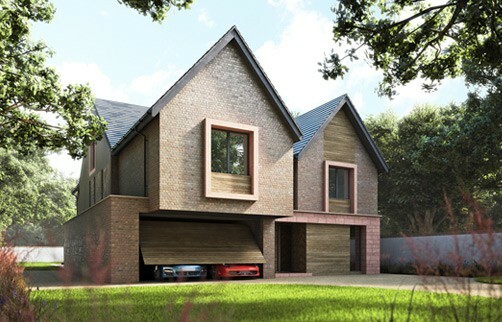 Reid Architects were commissioned by a development company to produce a new 5 bedroom dwelling to replace an existing dwelling located in Hale, Cheshire. The brief was to provide a house for family living. 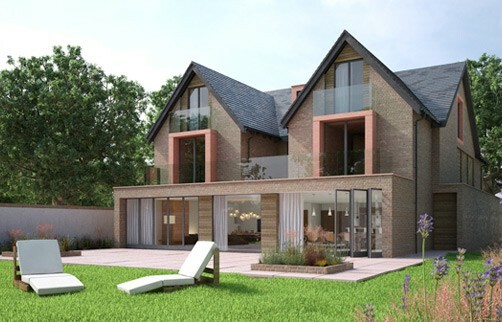 The house will accommodate 5 bedrooms with Living/Dining /Kitchen/ Media /Games rooms. The building is sensitive to its surroundings and takes best advantage of the site but respects the conservation area in which it is located. The concept of the building was to create a modern property that would reflect the way that families now live at home. The building has aspect to the back of the property and opens on to the garden embracing the external landscape. proportion of these forms underlines the quality of the architecture . The house has been orientated to take best advantage of the sun as it goes around the site during the day. The main living spaces are positioned to take advantage of the afternoon/evening sun and the garden spaces will have light most of the day. Construction will include high levels of insulation to ensure that the building has a high level of performance in its envelope and it will incorporate solar thermal panels to heat the hot water and energy efficient boilers.